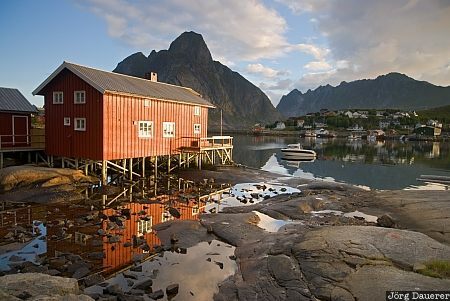 A typical red Rorbuer hut and its perfect reflexion in tide pools of the rocky coast of the Norwegian Sea near Reine with the mountains of Moskenesøy in the background. The island Moskenesøy is part of the Lofoten archipelago, Nordland in northern Norway. This photo was taken in the morning of a sunny day in August of 2010. This photo was the image of the month in August of 2012. This photo was taken with a digital camera.